Here (photo: Lene Pettersen) is my last addition to my nerd kit: A Double from Double Robotics. 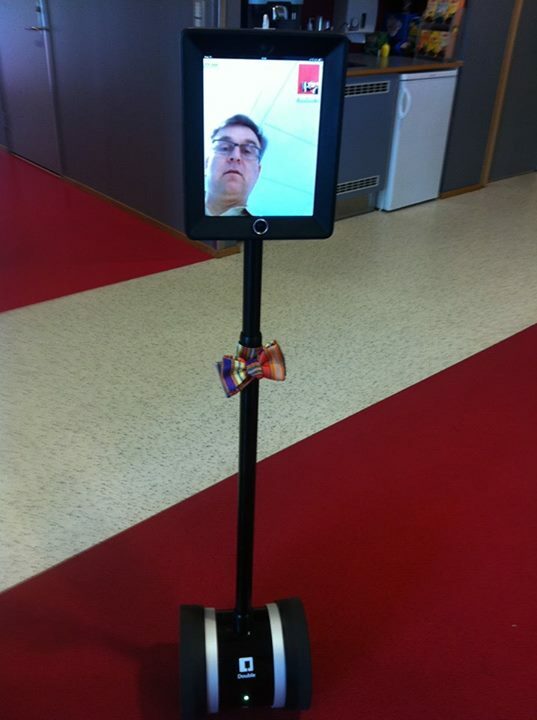 I suppose this is formally defined as a telepresence robot, but a simpler way to describe it is to say that it is an iPad stuck on a Segway. I spent most of Friday fiddling around with it, exploring what it can do. It is surprisingly natural in use: It can be raised (up to about five feet) and lowered, depending on whether you want to speak to someone standing or sitting. I drove it around the BI building, and quickly found that dead network spots (it needs a constant Internet connection to work) are problematic. Also, it is not very good at switching between routers on the same wireless network – it loses connection and needs a couple of minutes to find it again. I’ll probably have to get an iPad with a 4G connection, if such a thing exists (on the other hand, with a 4G connection I could send it out of the building and down the street.) Another problem was weak sound – in a room with other people speaking, the iPad speaker is too weak. I might have to get some small battery-powered speakers and Velcro them to the kit. elevators, doors and door sills, of course, are tricky. (Yes, this is actually research. And fun at work.) The use cases for a Double are several – I could advise students and go to meetings without leaving my home office, for instance. 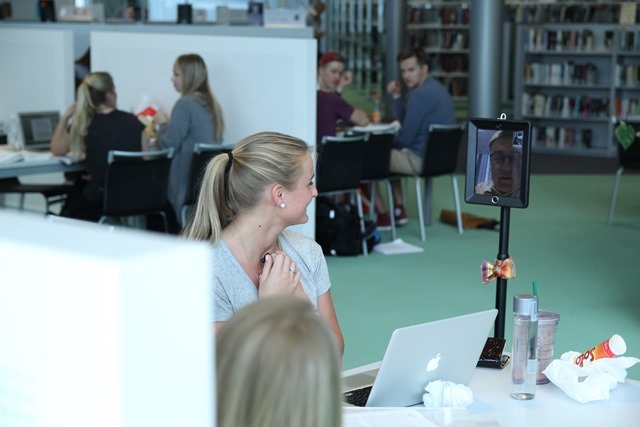 I have done that with Skype and other video conferencing tools for ages, but this thing is much less formal and allows you to putter around and talk to people. one of my colleagues has severe allergies and spends the spring as a pollen refugee in his mountain cabin – I am sure he would love to borrow it. 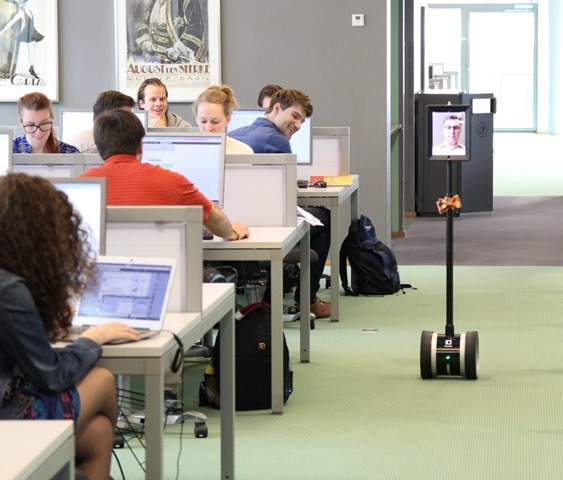 Compared to a picture on a computer or projection screen this little robot is much more intuitive and humanoid – you can see in which direction it is looking, for instance. I have been told that there are a bunch of these at Stanford, and that at first they were meant to be shared – but it turns out that people want their own, so they can personalize it as I have done with the ugliest bow tie I could find. My colleagues tell me it feels much more natural to speak to me through the Double than through Skype – it is almost as if I am there. This entry was posted in Academically speaking, iAD, Nerdy ruminations on May 24, 2014 by Espen. With two colleagues, Gerhard Schjelderup and Mikael Lönnborg, I am trying to create a case collection, to be published as a book. We start with a call for abstracts, with a deadline of June 9. You will find the details in this PDF document. 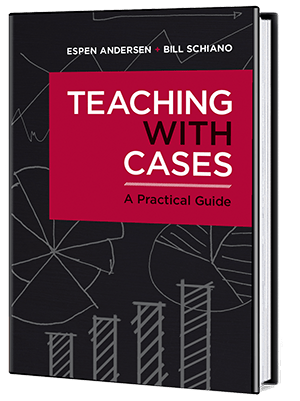 The main idea is simply to do something about the lack of available teaching cases on Scandinavian (or, for that matter, Nordic) companies. We want cases that are like HBS cases – no theory in the case, a thorough description of an interesting company with an interesting problem. Seems simple enough, no? See you for the workshop on October 10! This entry was posted in Academically speaking, Case teaching, Teaching on May 13, 2014 by Espen. My Chinese students (in the BI-Fudan “best-of-both” MBA program) refer to me as “Professor Bow Tie), for obvious reasons (though not in my presence – there, I am “Professor Espen”). On a couple of occasions, they have even showed up wearing bow ties themselves – and looking out over a room with 60 bow ties is rather distracting…. 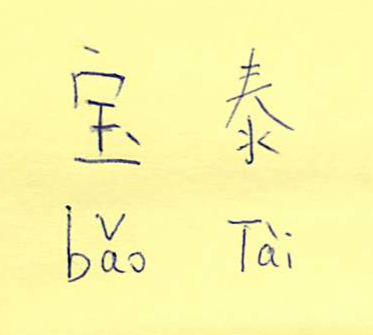 I have, obviously, no clue as to what it means (and I am pretty sure mispronouncing it could lead to some hilarity), but have been assured by the office that it is OK. Perhaps someone out there could translate it for me? This entry was posted in Blogging, Nerdy ruminations, Teaching on May 2, 2014 by Espen.